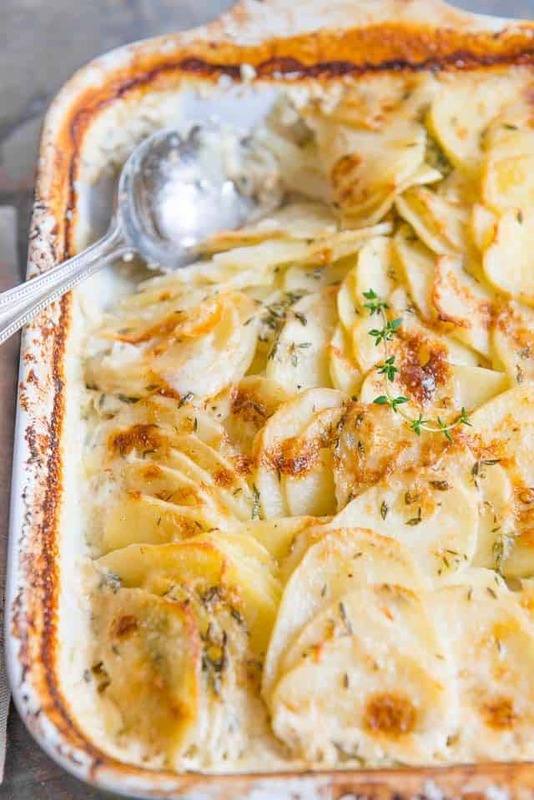 This Potato Gratin is the perfect simple side dish for any type of meal, whether its weeknight dinners or holiday meals. Thin slices of Yukon gold potato are baked in cream, milk, two cheeses, garlic, and thyme, until bubbling and golden brown. Do you remember after Thanksgiving, I shared a rundown of my Thanksgiving menu and talked about what I loved and what I didn’t? 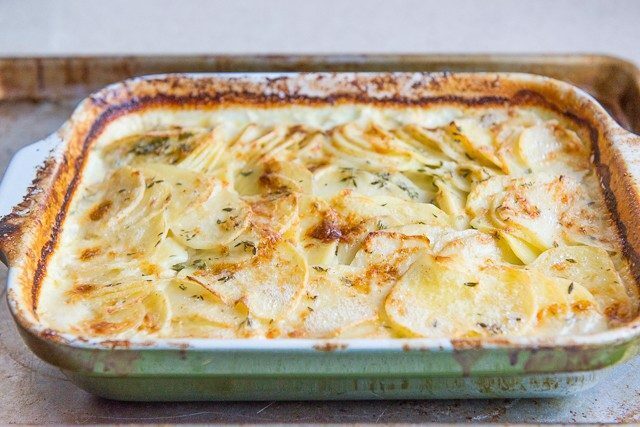 I mentioned how I decided to skip mashed potatoes altogether and make potato gratin instead, and how much more I love potato gratin as a side dish. (For the record, I still love mashed potatoes, but I think a gratin is better). This is how my mom always made potato gratin when I was a child. You’ll see that it’s quite simple, but oh man is it delicious. And the leftovers are even better. There are so many dishes that you can serve potato gratin with, like Slow Cooker Short Ribs, Parmesan Crusted Chicken, and Pork Tenderloin. I’ll share more suggestions below. There are a few things that I do with my potato gratin that make it a better dish overall. 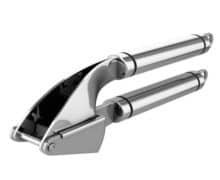 First, have the cream and milk together in a big bowl before you start slicing the potatoes, then put the potatoes directly into the milk and cream after you slice them, as opposed to storing them in a bowl of water as you do with many other recipes. We want to preserve the precious starch from the potato slices and release them into the milk and cream, so it thickens the liquid. 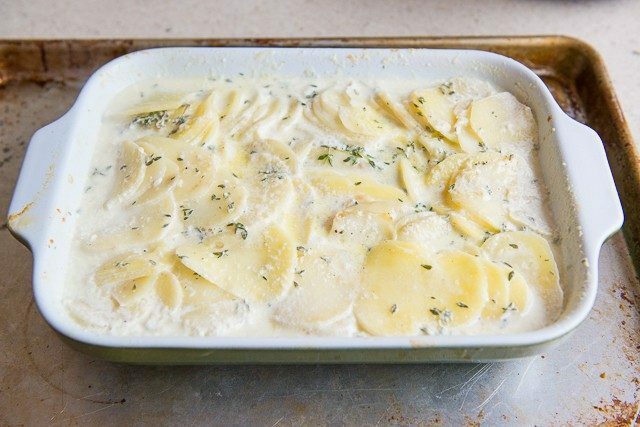 A lot of gratin recipes solely use cream for the baking liquid, but this way you can cut calories and fat slightly by replacing with milk, and letting the potato starch thicken the liquid. 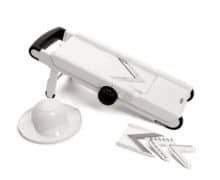 Also, I highly suggest using a mandolin for slicing the potatoes. While it’s possible to slice by hand, the slices will be uneven and it takes FOREVER. If you get a good quality mandolin, it’s not as scary to use as you might think, and I use mine ALL the time. 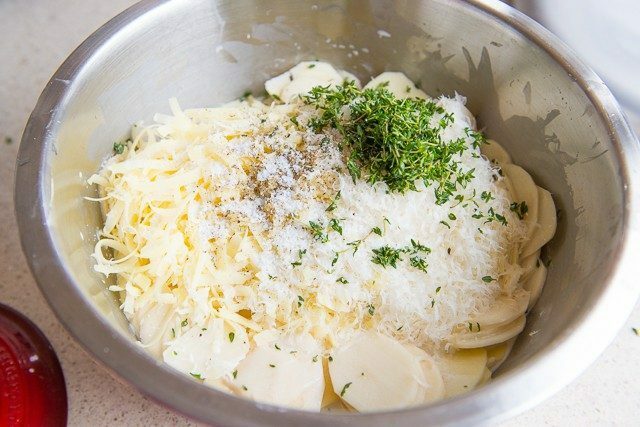 When the potatoes are sliced up, add two kinds of cheese. Both cheeses serve different purposes and are equally necessary. I find 2 tsp of salt is perfect for me, using a coarse kosher salt. Use less if you cook with table salt. 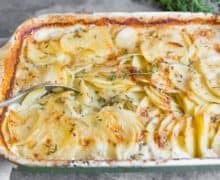 I think thyme is the best herb for potato gratin because it has a wonderful flavor, and a texture that isn’t disruptive. While you can do rosemary, the leaves are a lot bigger and more noticeable, so try to chop it up well if you go that route. 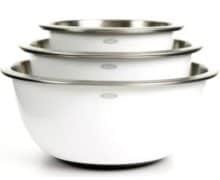 Toss the ingredients well to evenly coat the potatoes, then dump the entire contents of the bowl into an 8×12 baking dish and cover tightly with foil. Then, place the entire baking dish on a sheet pan. Trust me, don’t skip the sheet pan, or you’ll have a burned mess on the bottom of the oven. Since the liquid has cream in it, it loves to boil over and seep out the sides. That’s better. The potato gratin should now be very tender in the middle but cheesy and brown on the surface. Can Potato Gratin be Made Ahead? The only success I’ve had with making it ahead is if you can truly keep all the potato slices submerged in the cream and milk liquid to prevent browning, then you can make it the night before. You can do this by putting the potato slices, cream, and milk in a Ziploc bag and squeezing all the air out. There are some scattered ideas on the internet about parbaking the potato gratin, but accompanying reports of it not going well. Can Potato Gratin be Frozen? This doesn’t freeze well, unfortunately. The potatoes get mealy, and the cream clots up. Leave any more questions you have in the comments, and enjoy! 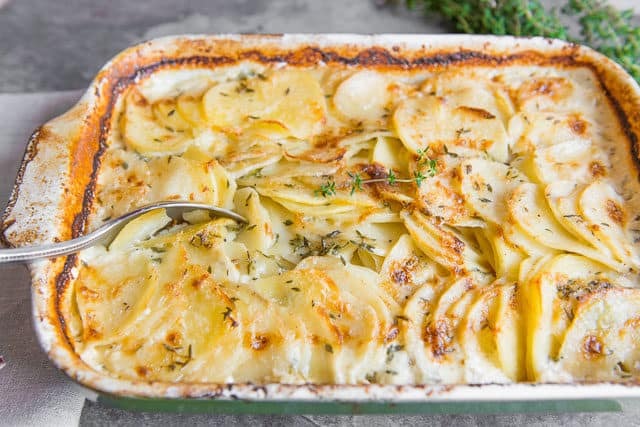 This Potato Gratin is the perfect simple side dish for any type of meal, whether its weeknight dinners or holiday meals. Thin slices of Yukon gold potato are baked in cream, milk, two cheeses, garlic, and thyme, until bubbling and golden brown. In a large bowl, combine the heavy cream and milk. 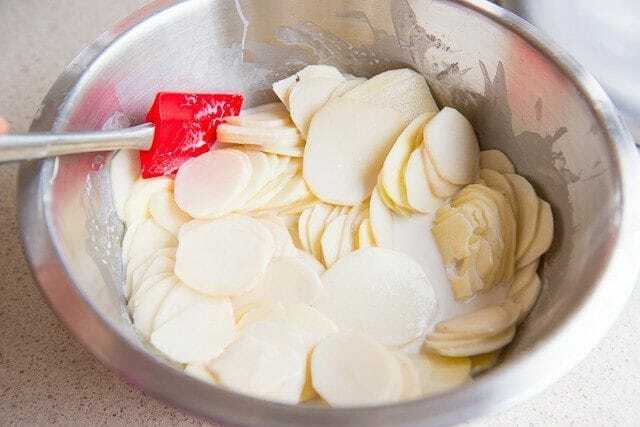 Using a mandolin, slice the potatoes very thinly (if you don’t have a mandolin, you can use a knife, but it will be a lot more work and time). As you finish slicing each potato, place it into the cream milk mixture so the slices don’t brown. 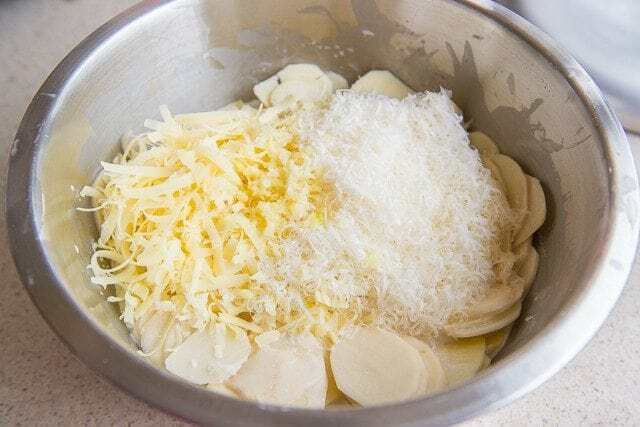 When the potatoes are all sliced, add the gruyere and parmigiano cheeses to the bowl, along with the garlic, the leaves from the thyme sprigs, salt, and a few cracks of black pepper. Toss well. 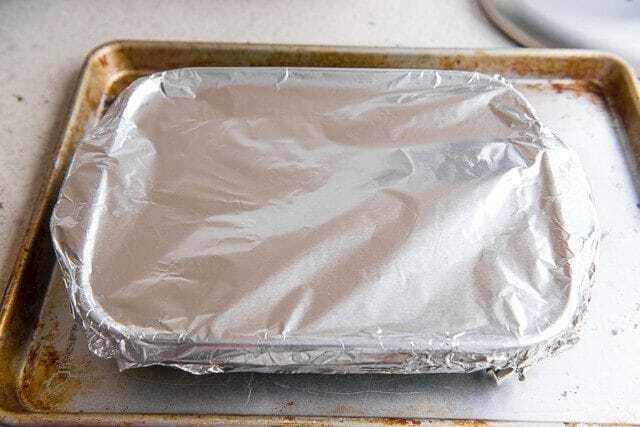 Pour the potatoes and cream into an 8×11 baking dish, then cover the dish tightly with aluminum foil. Place the baking dish on a sheet pan, then bake for 1 hour. Remove the foil and bake for 30 minutes more, until the potatoes are tender, bubbling, and golden brown on top. Serve and enjoy! How to reheat potato gratin: You can either microwave it until hot and bubbling, or re-warm in a 350F oven for about 10 minutes, until hot and bubbling. Love this one! I add thinly sliced onions and diced ham.